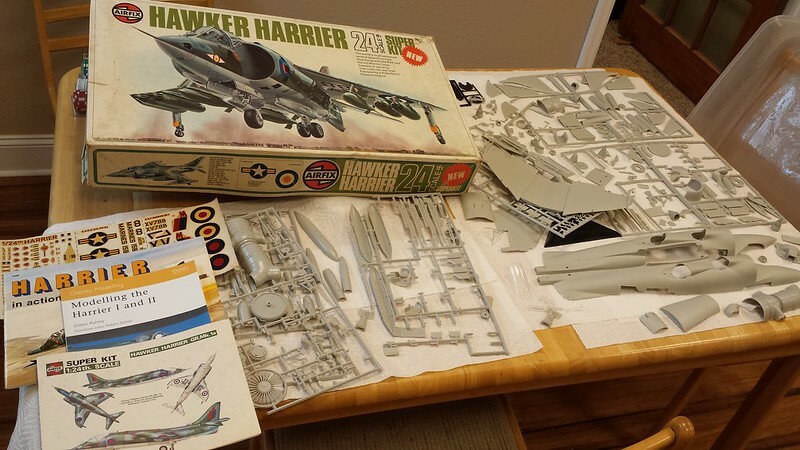 So after watching in amazement as Peter (easixpedro) and Pete "Pig" Fleischmann build massive scale planes from scratch, I thought I would join in the huge scale fun with my Christmas present from my wife, the venerable Airfix 1:24 Harrier GR.1. Of course, I'm not building this thing from scratch. I'm not THAT crazy. The kit was purchased off of eBay and is old. 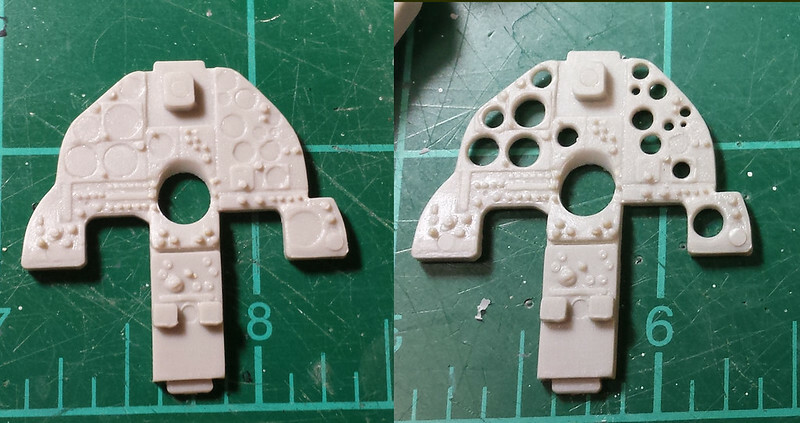 An awful lot of the parts are off the sprue and I hope they are all there. 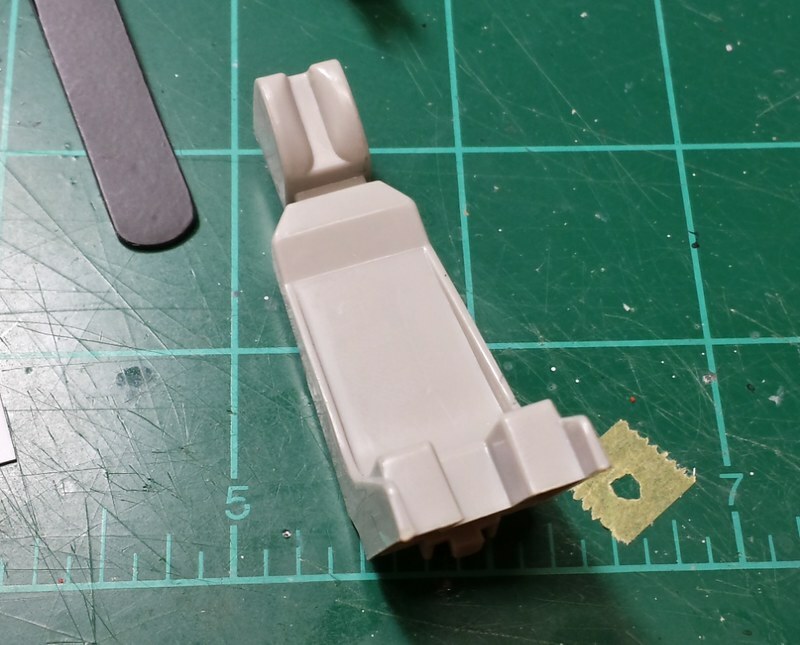 The decals are in terrible shape, but at this scale, I plan on painting most of the decals anyway and I can re-print the rest on my laser printer. I'm planning on doing an awful lot of styrene details for this guy. I can't wait. 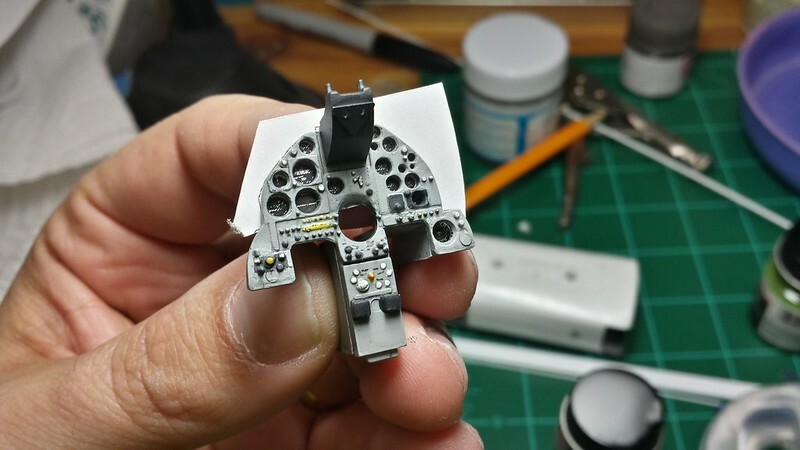 I'm planning on building this as the GR.1. 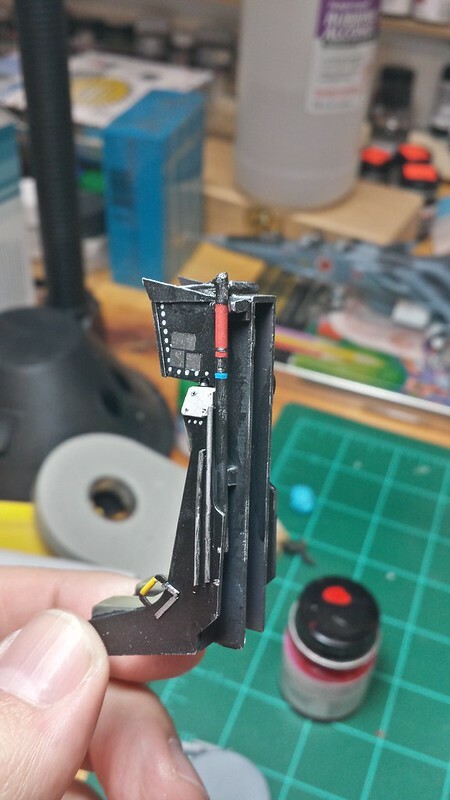 I know you can do all sorts of stuff to make a GR.3, Sea Harrier or other versions, but I'm planning on doing this only adding bits I make myself from styrene, wire and whatever else is handy. 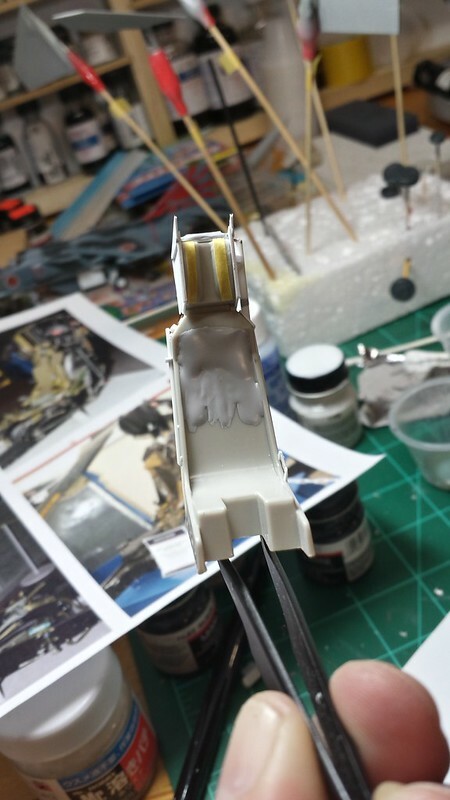 As I mentioned, I already started working a bit on it, specifically, the canopy had a spot that looked partially melted, but I was able to sand it down and polish it out and I think it should look fine now. Also, if anyone has some suggestions on paint schemes other than the traditional British camo, I'd love to see them, but they need to be on a GR.1 or AV-8A because that's what I've got. I'm also thinking of leaving the rivets, though they are a bit deep and it seems traditional to fill them, though I could be talked out of it. It would seem to be a big job that I'm not sure I want to tackle. 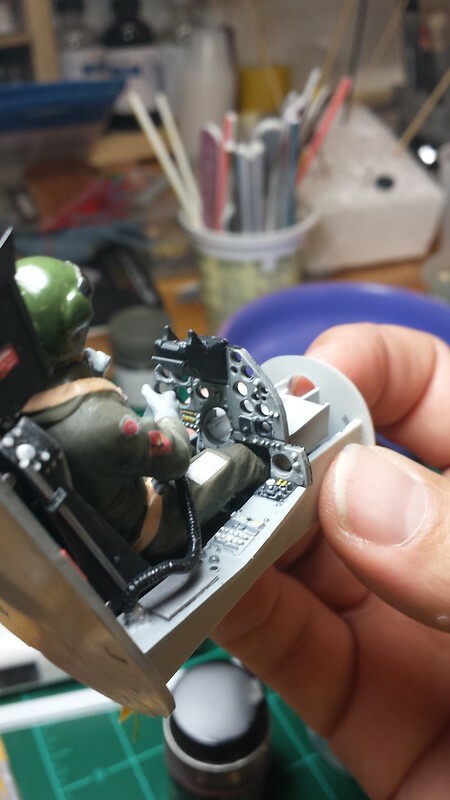 So, as is traditional (but not as indicated in the instructions), I'm starting with the cockpit. One of the things I'm planning on doing with this model is lighting it. 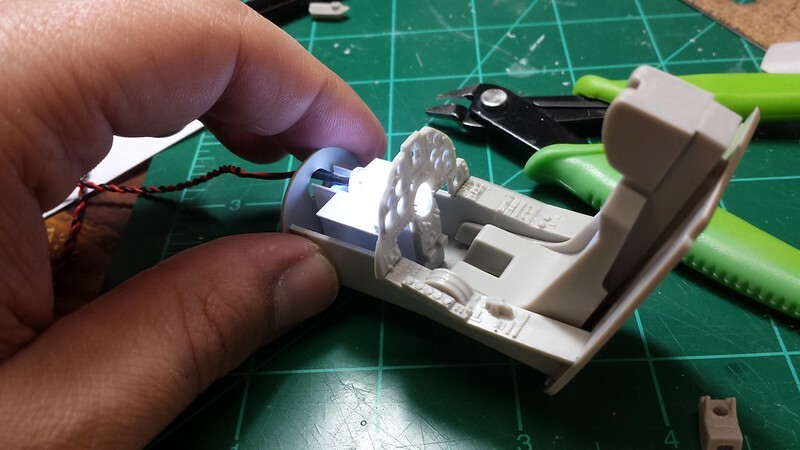 I've got a bunch of electronics stuff from my RC and electronics hobbies and I'm going to have a proper lighting kit for the plane as a whole. 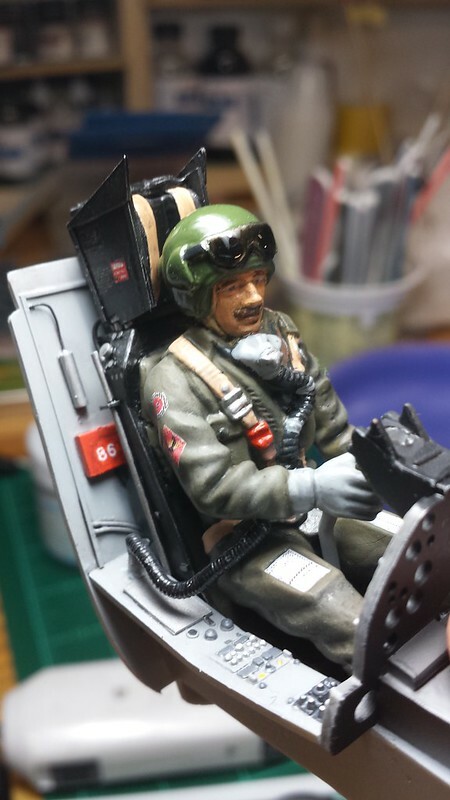 Part of my plan is to also light the cockpit. 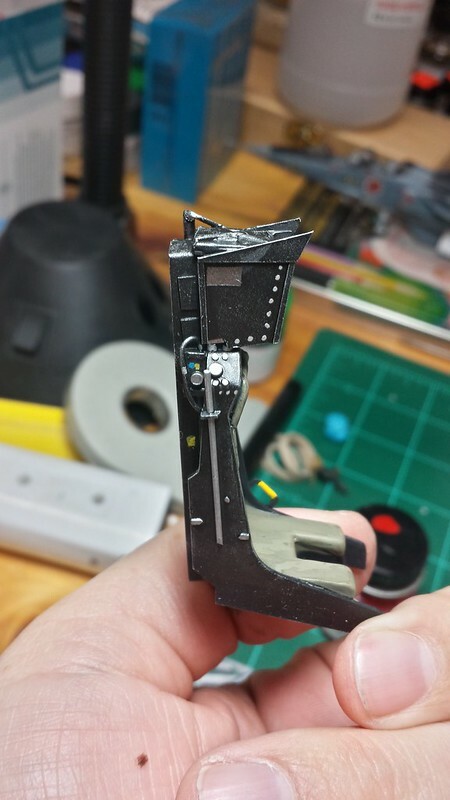 So often, the cockpit is too dark to see much detail, but that won't the case on this baby. 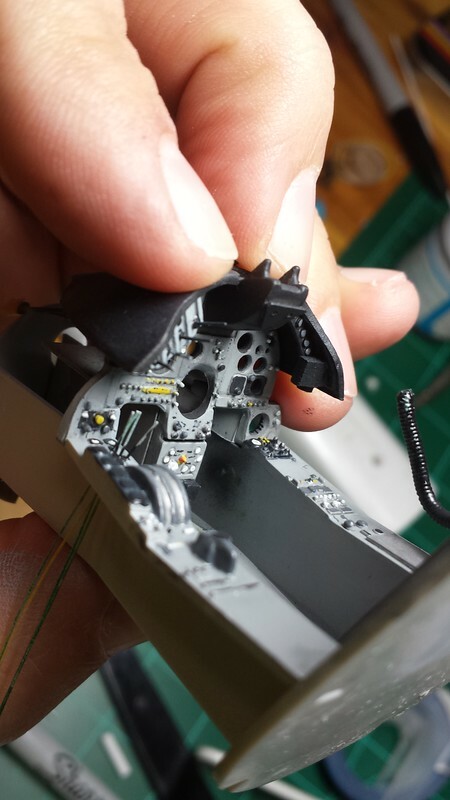 To that end, I drilled out the dials on the instrument panel. Oh, and I did drill out that last dial - I just took the picture before I did so. 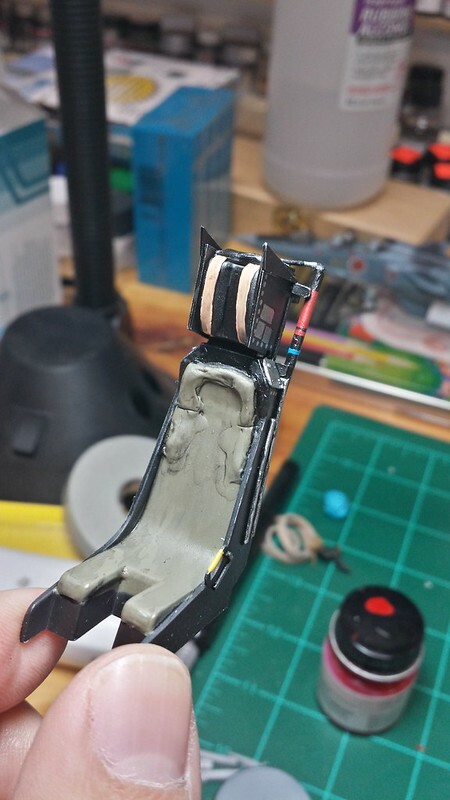 Some more cockpit details: I've added some styrene to the back of the instrument panel in preparation for the lighting and have begun testing the lighting and fit of the cockpit. 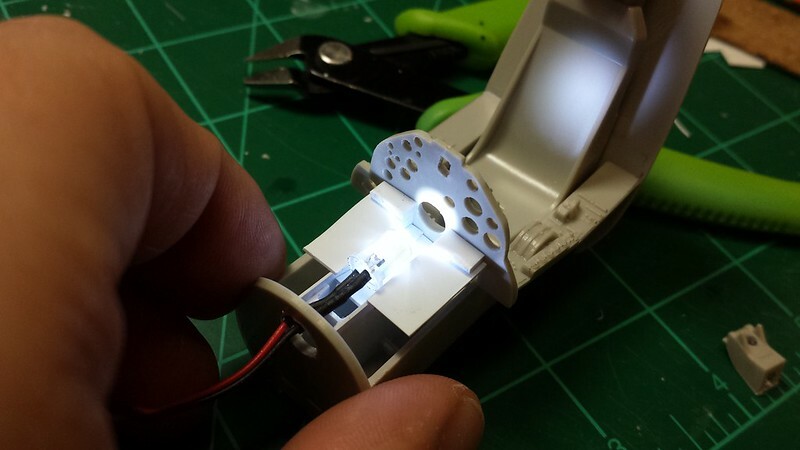 For the HUD, I've drilled it out, added some styrene and covered the inside with aluminum foil to help the light go through the tunnel, but not through the plastic. I've tested it out and it works really well - plenty of light coming out the top, but none bleeding through. The light bleed is not huge and I think foil will take care of any issues. 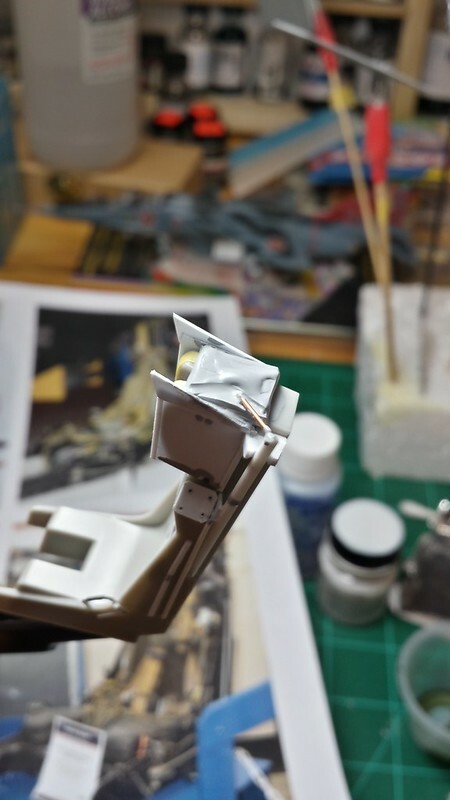 In dry fitting the fuselage and the glare shield to see how well it fits, I've realized that there is a significant gap on the top left and right corners of the panel between it and the glare shield. 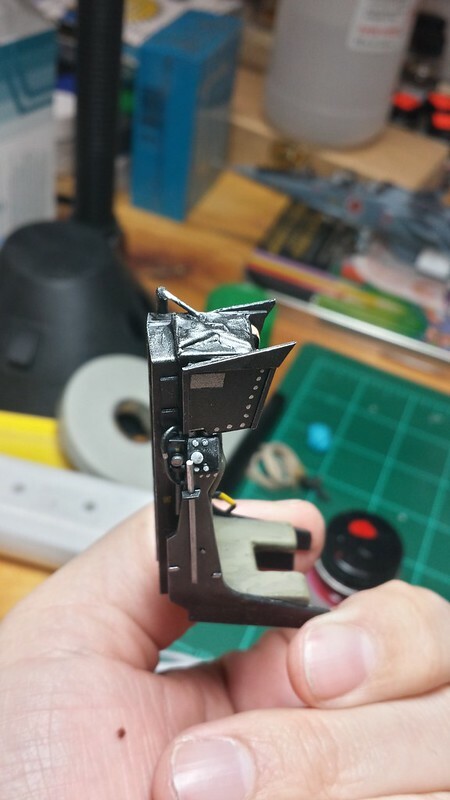 In looking at photos, there are some instruments generally hanging under the glare shield, so I'll need to do a bit of work to fill that in with some sort of appropriate looking gizmology to close off the gaps. oh, I like it! Glad to see another large a/c on here. Though I think you'll end up putting in as much work as I have--I've heard that kit is a beast. 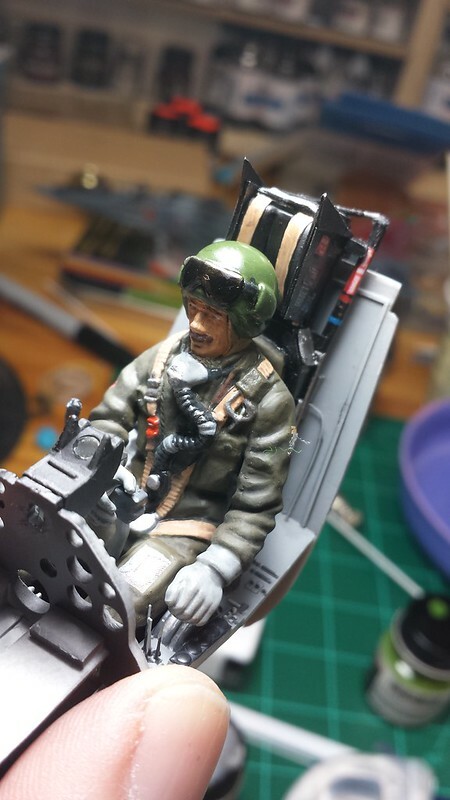 So I've been working on the pilot, Flt Lt Archibald Heatherington Nastyface and I must say I'm pretty happy with him. I'm particularly happy with his manly mustache, made from Mr. Surfacer 500. 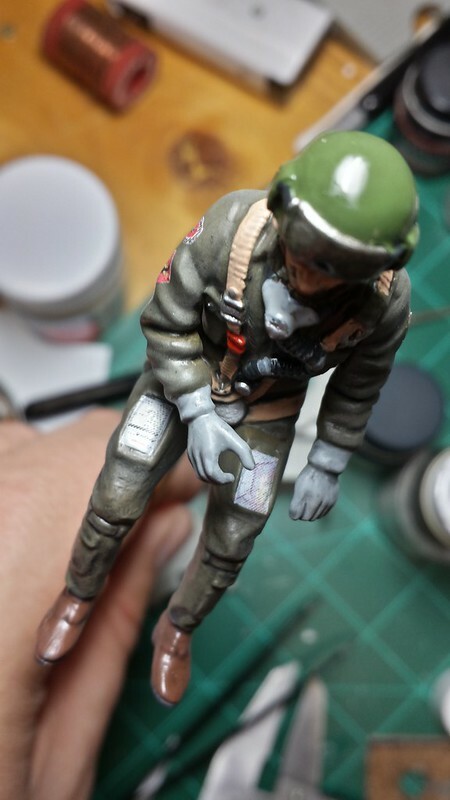 I'm also happy with his checklist and map on his pants. The original kit decals have me putting a decal on his helmet (it looks like wings or something) but I felt it looked fine the way it was. I think the surfacer worked well for the chute (I think that's what it is...) on top of the seat. 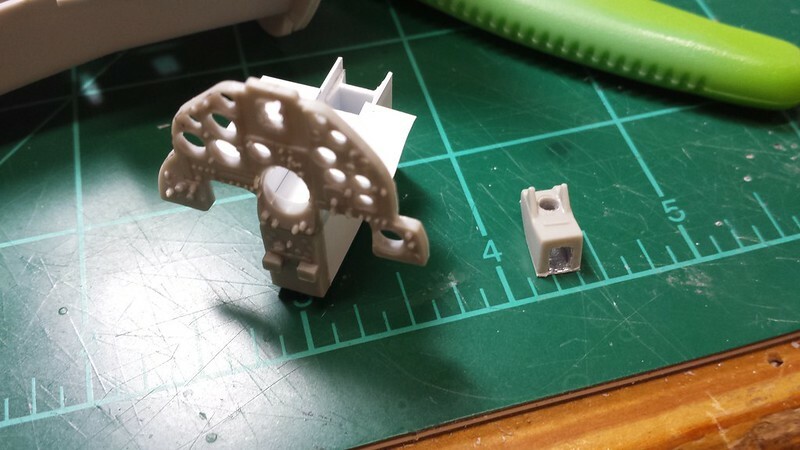 I also tried to see if I could do some screws with the surfacer, but it's too goopy to do a good job, so I'll be removing those with some thinner. 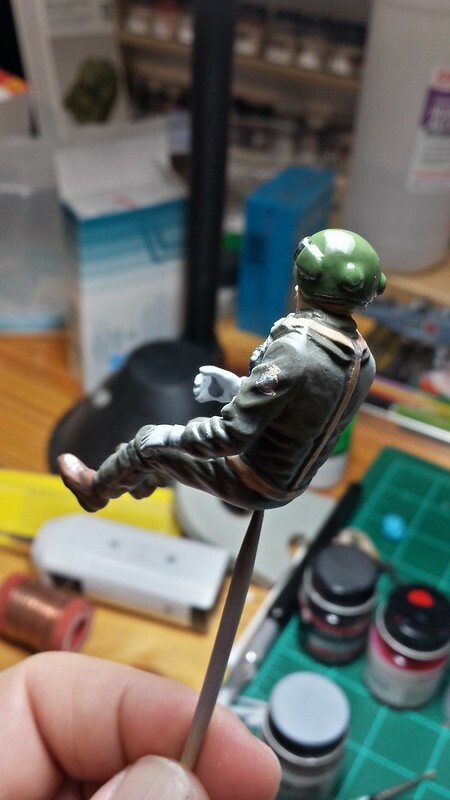 I'm aware of Archer rivets etc., but don't have any on hand. I'll probably just paint them. That's all for today. 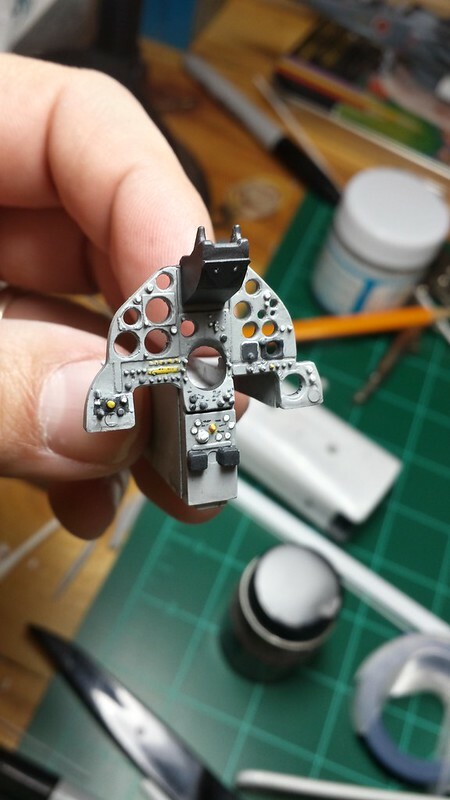 I'll probably be doing sidewalls and rear cockpit bulkhead detailing next. Looking good. The seat looks aweome and cant wait to see the ockpit closed up with the lights. 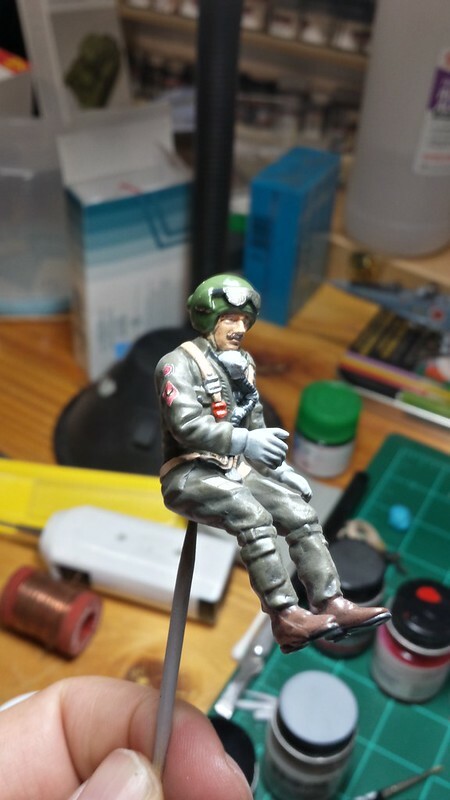 I've got the seat base painting done and I'm pretty happy with it. 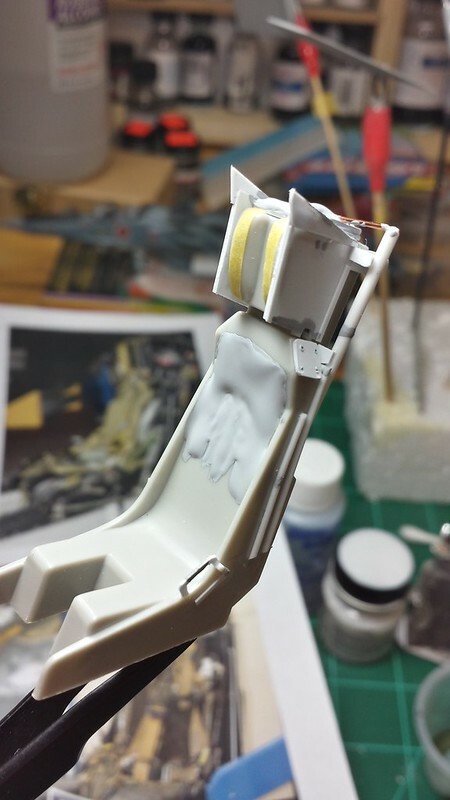 Note that the seat back and bottom won't really be seen except on the margins since the pilot will be sitting there. I'll need to add some decals and maybe touch up a bit of paint. I'm not super happy with the silver screws or whatever they are. I may paint over them in black and allow that to just create a subtle raised effect. We'll see. 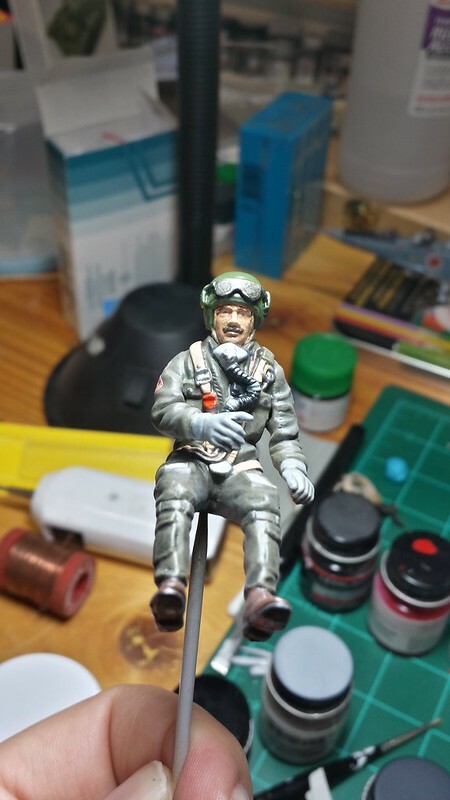 I also did a bit of work (no picture) on Flt Lt Nastyface, particularly with dull and glosscoat to make his flight suit look a bit more like cloth and to make his mustache less shiny, while overall creating some nice contrasts in reflectivity. The effect is subtle, but nice, moreso in person than in photos, I suspect. But, of course, I didn't take a picture. I've got the seat decalled up now and thought I'd share. I'm particularly proud of the shiny placards - I underpainted with silver and then printed a black decal on clear decal paper to place over it and they turned out just how I'd hoped. 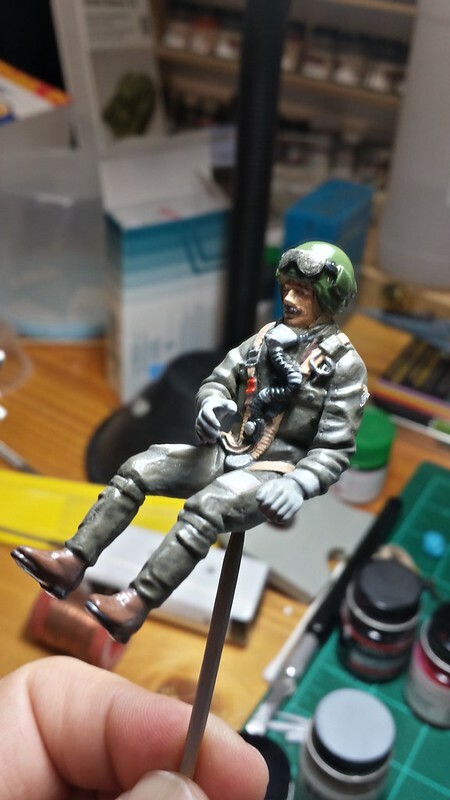 The pilot's not attached yet - I just stuck him on for scale. 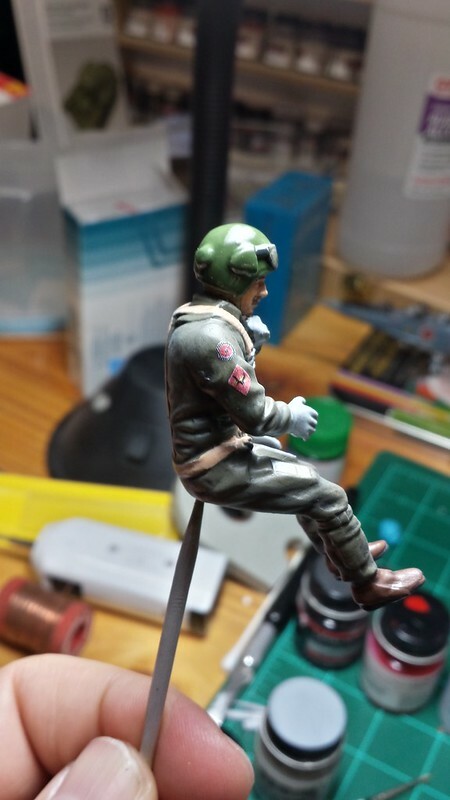 Question for those who know about such things: Should the parachute pack (I think that's what it is on top) be a different color? I wasn't able to find any good photos of that area. Thanks! 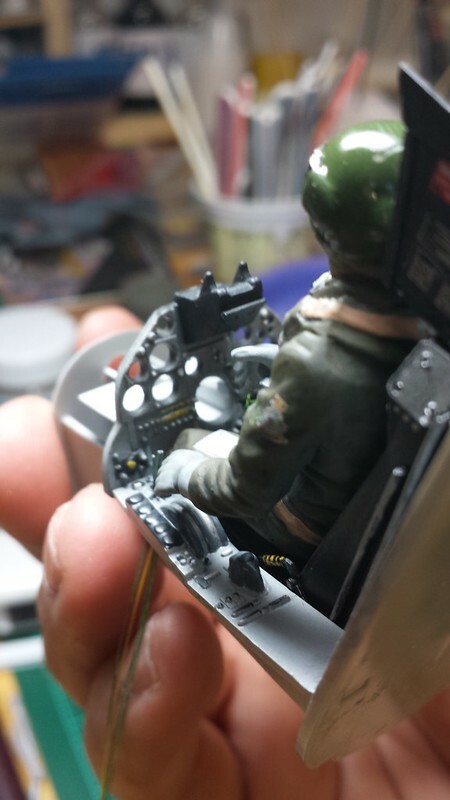 I've been detailing (mostly with imaginary gizmology) the cockpit and then painting it, along with running fiber optic line in a few places. 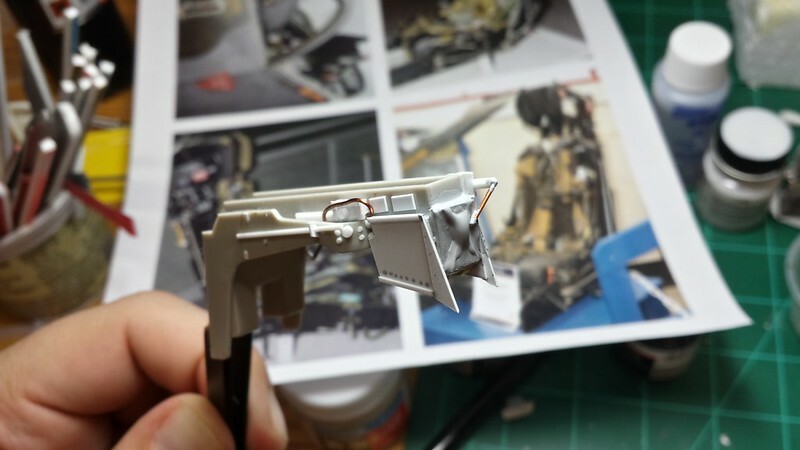 For those who aren't aware of how to do fiber optics, you glue the line in place with it long, paint whatever you want to paint (including the fiber) and then cut it flush when you're done painting and it'll shine nicely. I haven't yet cut it, but will be doing so soon. 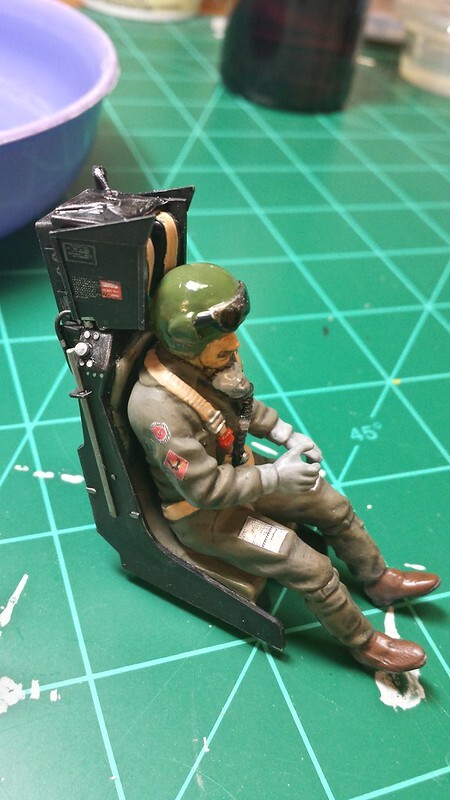 My next step is to put on the dials decal, glue all the cockpit stuff in place and then light up the cockpit. I also need to work on the HUD, but I'm going to wait a bit on that. I'm particularly happy with the oxygen hose - I wrapped a thin wire around a thicker wire and it looks the part. Anyway, I'm happy with it. Another question - did the GR.1 have the det cord in the canopy? I'd assume so, but I can't find any pictures clear enough to figure that out. Yes, VTOL aircraft have to have a det cord due to the fact that there could be a need to eject during slow or vertical flight. 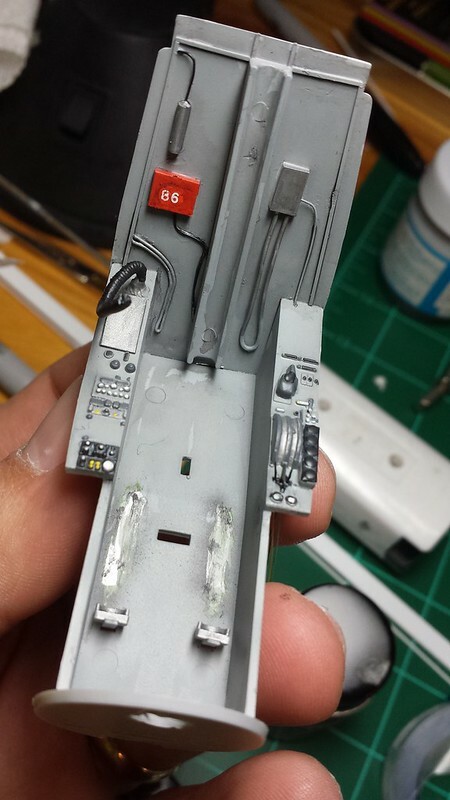 Not sure if there is a PE set for the 24th scale kit but the Eduard PE set for the 72nd scale GR1 has the det cord for the canopy in it. 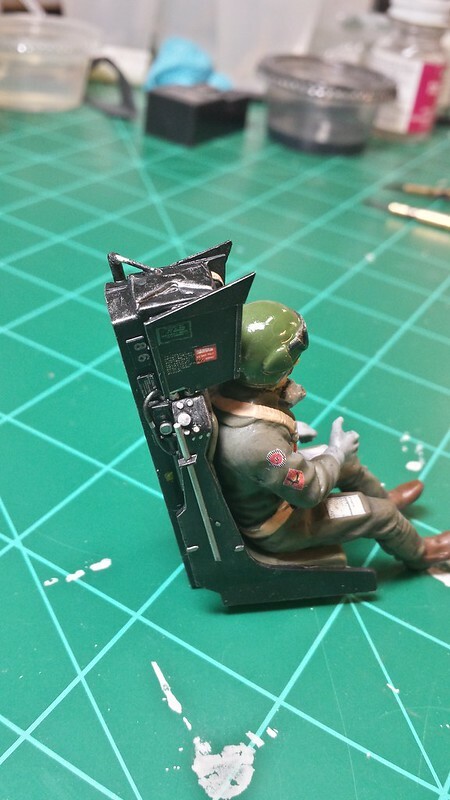 1/24 and that's the best they could do for a seat? Yes, VTOL aircraft have to have a det cord due to the fact that there could be a need to eject during slow or vertical flight. Thanks. I may see if I can get a set and then scale it up. It's a really old kit and a bit more of a toy than a display model. But, yup, that was what they gave me. You're a brave man Mr Sunder, but it's looking great so far. The instrument panel is very good. Thanks, I hope to have it lit and together later this week. 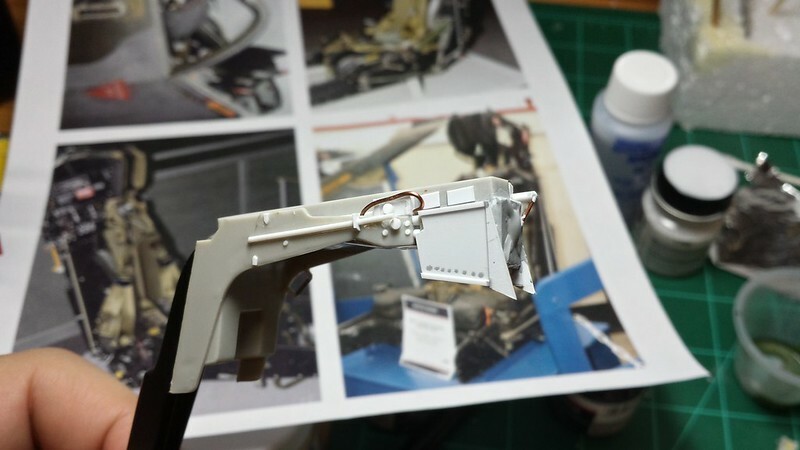 for the photo etch for 1/72 scale GR1. I was thinking of just using that as my template and scaling it up (though maybe making it a bit thinner). Assuming that's the correct shape, can anyone tell me what color it should be? The ones on later Harriers appear to be a light gray. Is this correct? 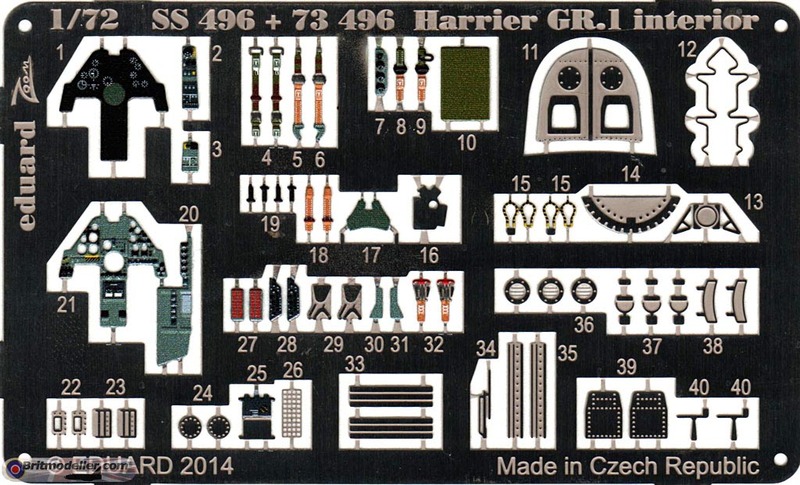 Flightpath do a massive update set the for the 1/24 Harrier if your interested. I am aware of that and am quite tempted. 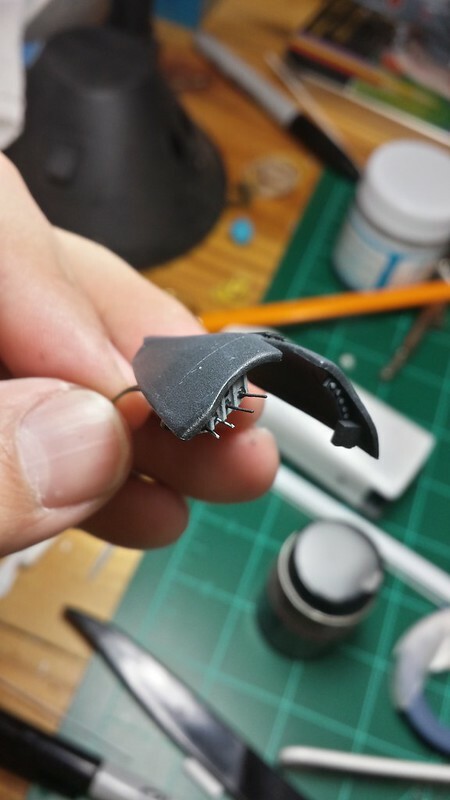 However one of the challenges of this particular build for me is that I want to update everything myself with styrene and other bits. 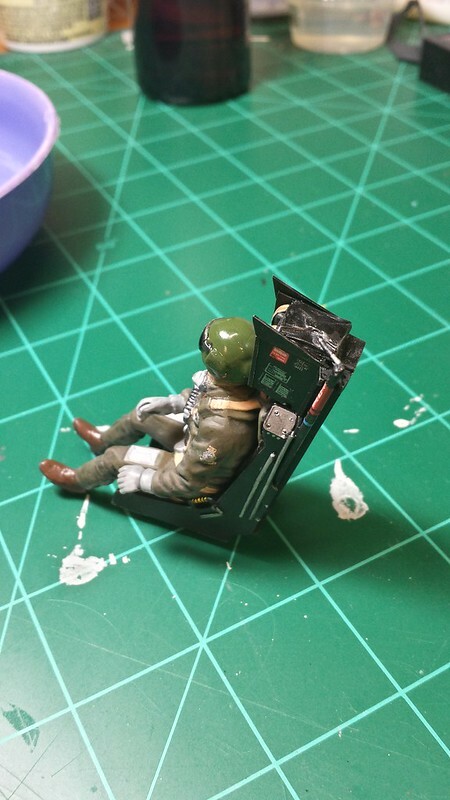 I think that doing things like the ejection seat updates that I did are my favorite aspects of model building. 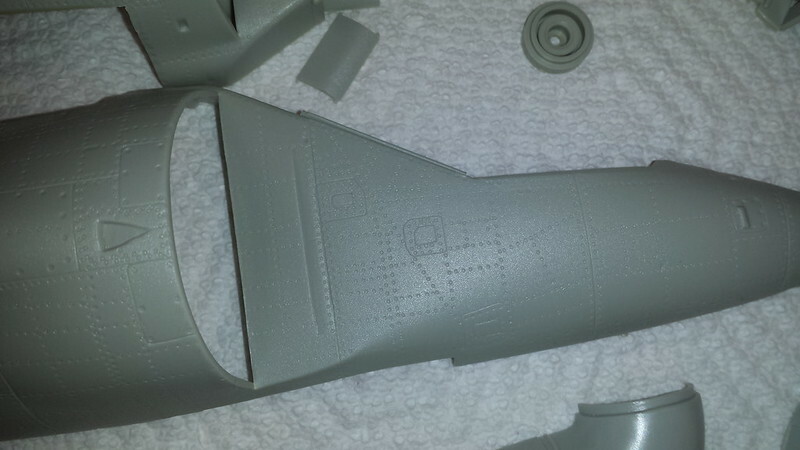 There's just nothing like the feeling of spraying primer on custom work and seeing it blend in and become part of the model. I love that. Hi Ed, I have also searched high and low for the MDC on the GR.1 and wasnt able to find anything definitive that shows it there. It is very apparent on later mark harriers so the only explanation I can think of is that the GR.1 has a flexible linear shaped charge that runs along the frame of the canopy. Unless you can find that that definitive picture showing the MDC on top of the GR.1, I would leave the canopy alone. Guess eduard PE set is wrong. Fangs_Out - that thought had certainly crossed my mind. I know it had the MDC, the question is what it looked like. I also had thought that maybe it ran along the edge of the canopy.